The Samsung Series 5 Ultra is the company's first foray into the Ultrabook market (if you don’t count the Series 9, which predates the Ultrabook brand). There's just one problem: It weighs nearly 4 pounds, and measures 0.82 inch thick. In other words, this 14-inch laptop is closer to a regular ol' ultraportable than it is to an Ultrabook. Ultrabooks are high-end, ultrathin notebooks defined by Intel as being 18mm (0.7 inch) thick at the most--but that specification is for models with screens 13.3 inches or smaller. With the advent of the Series 5 Ultra, Intel has stretched the requirements to make 21mm (0.83 inch) the standard thickness for machines with 14-inch or larger screens. Nevertheless, the Series 5 Ultra looks a little, well, thick, especially when it's sitting next to other Ultrabooks. In fact, it looks almost as chunky as my 15-inch MacBook Pro, which measures 24mm (0.95 inch) thick. Needless to say, the Series 5 Ultra hardly inspires the same oohs, aahs, and oh-my-gosh-that-laptop-is-so-thins as other Ultrabooks do. But there's a reason that this particular laptop is so comparatively hefty: It has both a DVD-RW drive and a 500GB hard drive. Our review model, priced at $950 (as of March 30, 2012), features an Intel Core i5-2467M processor, 4GB of RAM, and Windows 7 Home Premium. It also has built-in Wi-Fi, Bluetooth 3.0, and a 16GB solid-state cache drive that helps it boot quickly and resume from hibernate more rapidly (a necessity for Ultrabook branding). The Series 5 Ultra sports a minimalist design and looks an awful lot like Apple's MacBook Pro line. The laptop's cover is a smooth, lightly brushed slate-gray aluminum with a small silver Samsung logo on the left side. The interior is largely the same: smooth, lightly brushed, and slate-gray, though not all of it is aluminum (just the wrist-rest area is metal; the remainder is plastic). The laptop feels sturdy (and heavy, for an Ultrabook), though the hinge is a little squeaky. The laptop has more ports than the average Ultrabook, probably because the machine is thicker than the average Ultrabook. On the left side, it provides a fold-out gigabit ethernet port, two USB 3.0 ports, VGA-out, HDMI-out, and a combined headphone/microphone jack. The right side is mostly dedicated to the tray-loading DVD-RW drive, but Samsung also squeezes in a lock slot, a USB 2.0 port, and a four-in-one card reader. 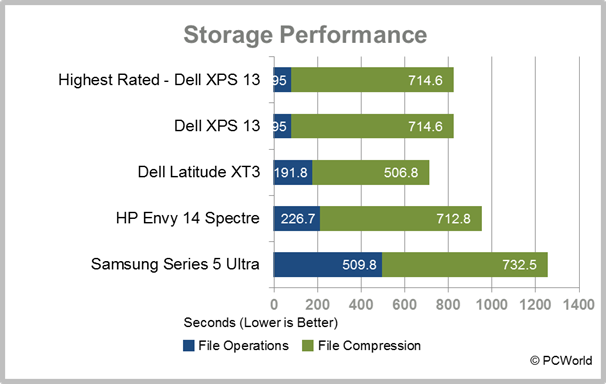 That's a lot to pack into an Ultrabook, and the other Ultrabooks we've seen have had no more than one USB 3.0 port. You won't find much on the keyboard deck of the Series 5 Ultra--just a small silver power button, a moderately roomy touchpad with two discrete buttons, and, of course, the full-size Chiclet-style keyboard. The keyboard is fairly comfortable to type on, though the matte-black keys are a little small and give slightly weaker-than-average feedback. The touchpad is less impressive: It's smooth but not very sensitive, and the buttons feel cheap. In fact, on our test unit the left mouse button appears to sit lower than the right one, and feels as if it will break after a few months of normal usage. The touchpad supports multitouch gestures, such as pinch-to-zoom and two-finger scrolling, but the results are somewhat jumpy and inaccurate. For example, when you try to scroll with two fingers, Web pages jump up and down erratically instead of moving smoothly. A thin, silver bezel surrounds the Series 5 Ultra's matte 14-inch screen. At the top of the bezel is a webcam, complete with a pinprick LED that indicates whether the webcam is turned on (in other words, exactly the way Apple's MacBook Air is set up). The screen looks pretty good. It has a native resolution of 1366 by 768 pixels, which is a little low for a 14-inch display. By comparison, the Asus Zenbook UX31E has a native resolution of 1600 by 900 pixels, and a 13.3-inch screen. Likewise, Apple's 11-inch MacBook Air has a native resolution of 1366 by 768 pixels--but, of course, its screen is smaller. The Series 5 Ultra's screen is extremely bright at its brightest setting (perfect for working in direct sunlight), and color representation is mostly accurate, though colors sometimes look washed out. The screen's temperature seems a little on the cool side, which means that whites occasionally take on a bluish tint. That effect is hardly noticeable, however, unless you turn the brightness up and look at a mostly white screen. 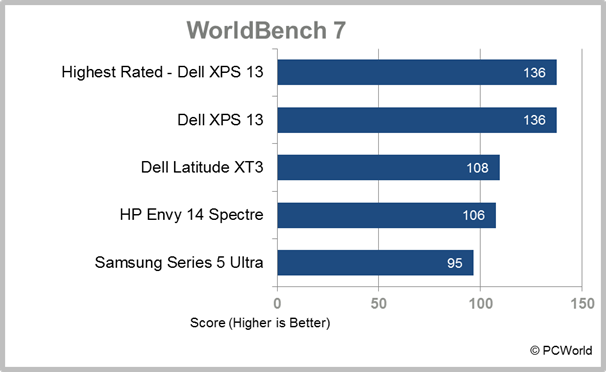 In PCWorld's WorldBench 7 benchmark tests, the Series 5 Ultra performed well for its category with a score of 95. 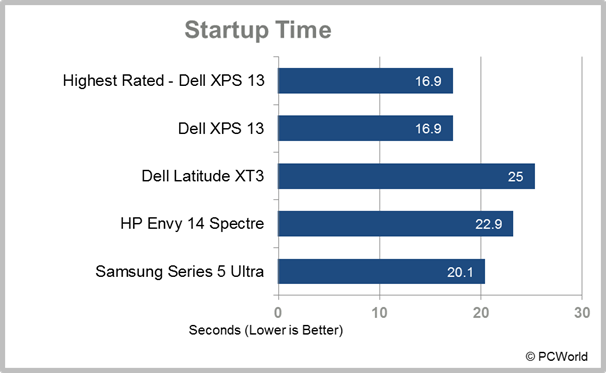 This means that the Series 5 Ultra is only 5 percent slower at general computing tasks than our baseline reference PC, which has an Intel Core i5-2500K processor, 8GB of RAM, a 1TB hard drive, and an Nvidia GeForce GTX 560 Ti graphics card. The Series 5 Ultra didn't do quite as well in our graphics tests, as it relies on Intel's integrated graphics technology. In our Crysis 2 graphics test, the Series 5 Ultra spit out only a wimpy 23 frames per second (low quality, 800 by 600 resolution). The machine did better in our Dirt 3 test, with frame rates ranging from a decent 40 fps (low quality, 800 by 600) to a not-so-decent 13 fps (high quality, 1366 by 768 pixels). Samsung's Series 5 Ultra may not be a gaming machine or even a multimedia powerhouse, but it does have a DVD-RW drive, which is more than any other Ultrabook can say. Video looks good on the Series 5 Ultra, though high-resolution content occasionally suffers from artifacts such as blocks--especially in motion-heavy scenes--and general choppiness. The speakers, located along the top of the keyboard, produce loud but thin and bass-less sound. Here's the thing: Samsung pitches the Series 5 Ultra as the first Ultrabook to sport an optical drive. But it's not, because it's not an Ultrabook. Sure, it may (barely) hit the 21mm thickness mark, but it contains a hard disk drive (along with a cache SSD for speedy startup) and it weighs 3.9 pounds. Don't get me wrong, this is a decent ultraportable laptop--it's just not at all what I think of when I think "Ultrabook." Still, if you're looking for a small laptop with more ports and functionality than an Ultrabook, the Samsung Series 5 Ultra is your machine. Although the Series 5 is a good ultraportable laptop, it's too thick and heavy to be an Ultrabook.